Can anybody else read my emails? Mailboxes, Shared Mailboxes, Distribution Lists, and Room mailbox. Organizing your messages: Flagging messages and adding comments to messages. Outlook 2016 provides tricks to help you manage your user needs, whether you are sending or receiving emails. 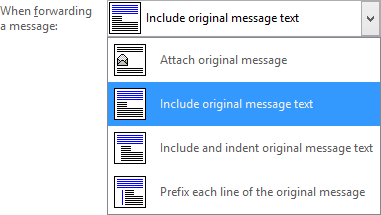 For those who are very particular, even bordering on OCD, with how they like to manage their time, Outlook has just the tools for you: flags. 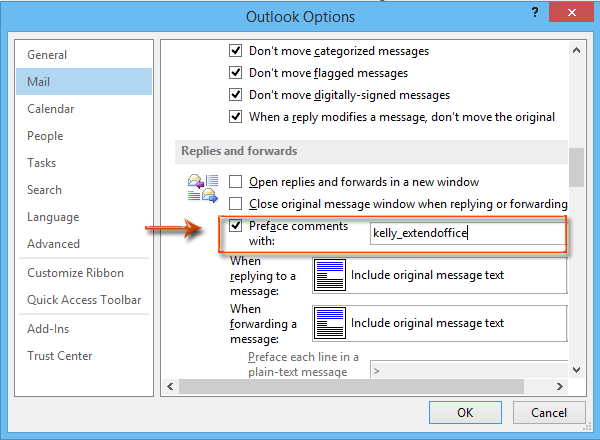 Over time, this has become a favorite tool among busy Outlook users, and career procrastinators. Flags can help you to note which emails to give priority and which ones to look at later. It’s possible to get overwhelmed when 30 new and important emails come through at the same time. You need to be able to prioritize in order of urgency, otherwise some emails could get lost in the flurry of activity. You can also flag an outgoing message to remind the recipient of a follow up action they are required to take. 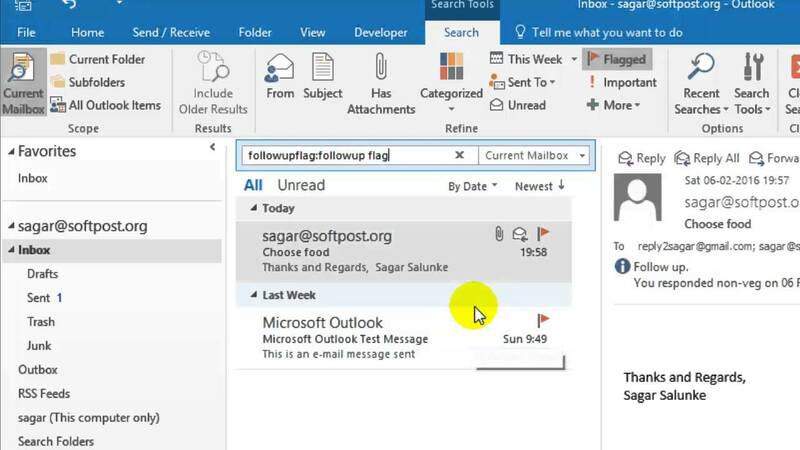 The fastest way to flag a message is to hover your mouse over a message in your inbox folder until you see the faint gray outline of a flag on the right. When you click it, it instantly turns to red. This bright reminder will show you which messages you need to give a closer look. You can also find the flagged messages in your Task list, so that it will be easier to keep an eye on them. When you have dealt with the message, click on the flag again and it will change it to a check mark, to show you are done with it. Every time you flag a message, a copy of that message ends up in your Task list for today. If you feel that you might not be ready to deal with that particular message today, and would rather deal with it next week, you can change this. Simply right-click on the red flag in the message form and select a date or timeline from the options provided. If you wish to change the due date again, you can do so simply by dragging the item from one date to another on your To-do bar. Alternatively, you could double-click on the item to manually change the due date. If the due date passes with no action from your end, such as marking the message complete or assigning a new due date, the message heading will turn red. Either way, it will serve as a handy reminder to you of something pending in your in box. Sometimes it is not enough to simply forward or reply to messages. It might be necessary to include a comment so that the recipient knows exactly what you are responding to, and to distinguish which comments are new and which are from the original email. 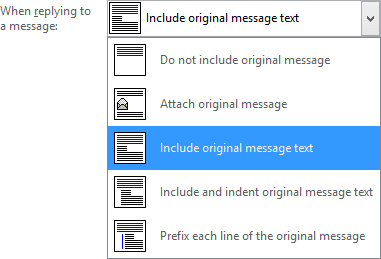 Outlook 2016 allows you to introduce your comments with your name or any other text, to identify them as yours. It’s usually best to use your name, although if you’re writing to a friend from your home computer, you could use a funny nickname or phrase. Open the Options dialogue box by selecting the File tab and clicking on Options on the ribbon at the top of the page. Click the Mail button on the navigation panel to open the Message settings window. Scroll downwards to the section labelled Replies and Forwards, and check the Preface Comments With box. Do not check the box if it was already checked, as doing so will uncheck it. Type your preferred preface text in the Preface Comments With text box. You have the option to delete the text of the original email message, although it is sometimes best to keep the text or at least the parts most relevant to your response. While Outlook 2016 gives you the option to boost up your message text by adding colors, graphics, smileys and other special effects, be mindful of the fact that if your recipient is using a web mail service such as Gmail, Yahoo! Mail or Hotmail, those effects might not render well. It is therefore best to keep it simple. Click the drop down arrow at the right end of When Replying To a Message. Choose your preferred style, confirming with the diagram on the left that it is what you want. Click OK when satisfied with your choices.